SALLY’S FIRED UP LIKE A ROCKET IN PRISON The prisoners are impressed when Sally calls them together, revealing she intends to speak to the governor about arranging some recreational classes. At visiting time, Sally tells her family of her plans to stand up for their rights. When Gina points out her mayoral days are over, Sally takes offence and tells Gina she wants nothing more to do with her. KATE PLANS A SPARKLER FOR KATE Rana arrives back early from her cruise. Jenny calls Kate to give her the heads up. Kate’s gutted to realise her plans for a surprise proposal at the port have gone awry. Meanwhile, Rana secretly asks a thrilled Johnny for Kate’s hand in marriage. ELSEWHERE Dev invites Gina for dinner, convinced there’s still a spark between them. CARLA GROWS MORE SUSPICIOUS OF NICK Leanne tells Nick how she was starting to believe they could have a future Suspicious over Nick’s evasiveness about his business commitments in Nottingham, Carla does some digging and discovers Nick co-owns a restaurant with a woman called Elsa. Peter asks Carla if it’s true that she still has feelings for him. GINA AND DEV’S DATE DOESN’T END WELL Gina’s in a foul mood after her fall out with Sally. Over dinner Dev flirts with Gina but he soon gets on her nerves. Realising they have nothing in common, Gina heads home where she cosies up next to Tim on the sofa with a box set. RANA’S HOMECOMING SPARKLES Kate and Rana are reunited. As they each produce ring boxes, they’re shocked to realise they were both planning a surprise proposal. 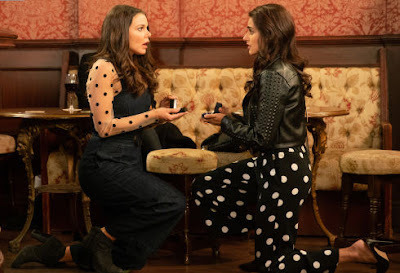 Utterly thrilled, Kate and Rana agree to marry. ELSEWHERE Michelle engineers a date between Ryan and Bethany to celebrate his homecoming. Ryan confides in Bethany how he’s been suffering from nightmares since the accident. Assuring him it’s nothing to worry about, Bethany seals it with a kiss. Not looking forward to Gina coming between Sally and Tim. Why would you do that? Even if she's fallen out with Sally, you still wouldn't do that. PS I wish they would write Ryan out. Horrible character. Gina has always been jealous of Sally, right back when Sally and Kevin got married. Sally seemed to have it all while she had nothing, and she still has nothing. But being jealous of your sister doesn't mean you don't love them and I don't think Gina is malicious. Impulsive perhaps, but this upset won't go far, especially if Sophie cottons on to what's happening. I do like the way Connie Hyde is playing Gina. The character could so easily become unrealistically OTT. Are Kana both pregnant in real life or is that just the most unflattering picture?